Zambia is a land-locked, tropical country which takes its name from the magnificent Zambezi River, which runs across the southern border with Zimbabwe up to the north-west corner. Most of the country is a high plateau without much variation in altitude so it appears much flatter than its mountainous neighbours. However, it boasts more intact Miombo woodland than any other country, as well as large lakes, vast floodplains and spectacular waterfalls. Zambian wildlife has adapted to the differences between the temperature and rainfall across the wet and dry seasons, and with 15 natural ecosystem types, it comprises of over 8,000 known species. World Land Trust (WLT) is supporting the conservation of Zambia’s wildlife through the Keepers of the Wild programme in partnership with the Kasanka Trust. Kasanka National Park is a sanctuary for a wealth of African wildlife on the southwestern edge of the Lake Bangweulu basin and is one of Zambia’s smallest national parks. 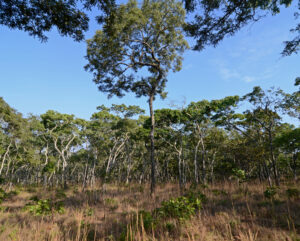 It is dominated by Miombo woodland but has pockets of rare habitat such as papyrus swamp, which is home to the world’s densest population of the rare Sitatunga antelope. World Land Trust works with Kasanka Trust through the Keepers of the Wild programme, funding two rangers who patrol the park, apprehend poachers and take students from local schools and tourists on tours around the park.